Last year, three of us visited Puerto Vallarta and we had a blast. I'd like to return, especially to visit the beach town of Yelapa and/or Sayulita. I bought the ticket through Southwest Airlines and United has flights too. We're staying in Zona Romantica. I reserved a room at Playa Los Arcos. You can also choose to stay in an Airbnb in the Romantic Zone. Even if we don't stay in the same lodging, we can be in the same area. Snap Travel sent me a 10 percent off offer for friends when using FB messenger. We had the best tacos at Pancho's Tacos and a great breakfast at Fredy's Tucan. Moreover, we visited the beautiful cathedral and took a day trip to snorkel under the arches. And our final evening we spent dancing at the hotel's restaurant where they had live music. The Botanical Garden was also a must visit based on an InterNations member (Violet) recommendation. The gardens have a swimmable river at the bottom of a cliff and a beautiful organic restaurant. 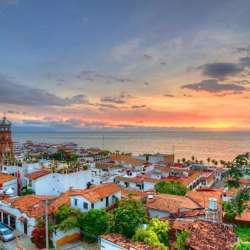 I found Puerto Vallarta to be less commercialized than Cancun and Playa del Carmen. We felt safe walking the cobblestone streets in the Romantic Zone where we stayed. If you decide to go, please don't hesitate to reserve your airplane ticket and hotel room.